As a pastor I often deal with death. Funerals are a regular aspect of ministry. And, if the truth be known, we are all dying at the rate of 60 minutes per hour! With that said, I would like to provide the key that unlocks the door leading to faring well in our farewell. The apostle Paul knew, by grace through faith, the gain that will be found on the other side of the grave. He knew and trusted in the Lord Jesus Christ . . . and that is the key to faring well in our farewell. Paul lived constantly in the light of eternity. He was so captivated by Christ that his earnest desire was to depart and be with Him, yet he knew he had more ministry to do in this world until that moment when his Lord would call him home to be in the next. Paul knew that whatever joy and pleasure he experienced on this side of the grave paled in comparison to what he would experience in the presence of his Lord on the other side. It was Paul who reminded the Christians in Corinth of Isaiah’s word of encouragement: “No eye has seen, no ear has heard, no mind has conceived what God has prepared for those who love him” (1 Corinthians 2:9). Paul knew he would experience the fullness of his salvation in unveiled and unhindered intimacy with Jesus. Because Jesus was Paul’s greatest treasure in life, he knew his greatest gain would be death. Do you know that truth? Sadly, for many, the answer to that question is no. Those who have not trusted in Christ alone for salvation will fare poorly in their farewell. They have lived for treasure infinitely smaller than Jesus; when they are faced with their inevitable departure from this world they are overwhelmed with unsettling emotions. Death to them is not gain; it produces fear and an unimaginable pain of loss. Make no mistake, the way we die—the way we approach our final moments in this life (if we are given that time by our Lord)—makes it clear what our treasure has been. The only way to fare well in our farewell is to live like the apostle Paul and look forward to death as the ultimate gain, because we know that Jesus is on the other side, waiting to welcome us home. When our treasure truly is Christ, we will not fear death; we will know how to die well. I am reminded of the last words of Confederate general Thomas “Stonewall” Jackson. Mortally wounded at the Battle of Chancellorsville, Jackson hung between death and life for days. Toward the end he slipped into delirium, barking commands to imagined troops. Then, a witness recalled, Jackson’s tone abruptly changed. He smiled, and his last words on this earth were, “Let us cross over the river, and rest under the shade of the trees.” Thomas Jackson had no fear, no pain of loss—only eager anticipation of entering the presence of the Lord. In knowing how to die well we will know how to live well! We will refuse to live for anything smaller than Jesus. We will turn our backs on the fleeting pleasures of this world and focus on the all-satisfying eternal pleasure in the world to come. Only when we can sincerely say that “To live is Christ” can we live out the truth that to die is gain. This is faring well in our farewell, and nothing can ever rob us of this joy. 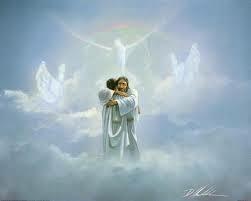 This has been my personal experience is saying good-bye to the saints of God. I hope it will both comfort you and challenge you to keep your eyes firmly fixed on what God has prepared for those who love Him.